The Alpine Tundra Chandelier brings the Montana Wilderness into your home with rich brown elk antlers and a free flowing, open design arrangement. This chandelier can range in size from 45″ to 50″ in diameter and 30″ to 33″ in height and be fitted with 5 to 10 lights as desired. The open arrangement of the Alpine Tundra lends itself to a more contemporary or modern decor yet still brings memories of the rich rugged mountains of the northwest. With 5 to 10 lights, which you can use 25,40 or 60 watt bulbs with, this heirloom quality chandelier will warm those cool alpine nights at your favorite mountain retreat. Antler Chandeliers & Lighting Company is please to include this fixture in our wonderful new modern antler lighting product line. Naturally shed real antler reflect the color of the habitat surrounding the elk. 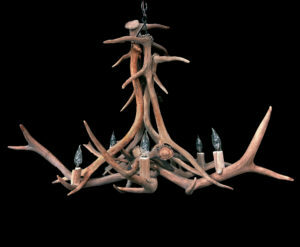 Any of our real Antler Chandelier designs can be made in this color.